What's the best protein to keep and gain muscle when you're older? As we age, we tend to lose muscle, but this can be reversed by a combination of resistance exercise and proper intake of protein — which is more than many older people consume. On their own, neither of these approaches will help — so don't just eat more protein, for example. All meats provide complete protein, providing all the amino acids needed for making muscle and in good balance, although some, such as fish, are more healthful than others, such as red meat, due to the type of fat they contain. Plant-based foods can also provide protein and build muscle, although, individually, they may not provide the optimal ratio of amino acids. Protein powders and protein drinks and shakes can also be good sources of protein. In general, whey protein is a great all-around protein for building and maintaining muscle and it contains all the essential amino acids. Be aware that it's made from milk, so it will naturally contain small amounts of fat, cholesterol and lactose. You can lower the amounts of these substances by choosing a whey isolate, which essentially isolates the whey protein from these other components. Whey and whey isolates taste somewhat like powdered milk. If you have trouble digesting protein or want to absorb it quicker, you can choose a whey hydrolysate in which the protein is, essentially, pre-digested, but be aware that hydrolysates can be somewhat bitter. Other types of protein are available and can be beneficial, such as casein (also from milk), pea, egg, rice, soy, and hemp. See the Protein Powder, Shakes & Drinks Review for more details about each type of protein, using protein to build and maintain muscle mass, how much protein to consume from food and supplements, and when during the day it may be best to consume protein. Be aware that 28% of the protein products that we tested at ConsumerLab in 2016 failed to pass our tests. Furthermore, among those that passed, the cost to obtain an equivalent amount of protein (20 grams) ranged from just 67 cents to over $5. Check out our Top Picks among the protein powders we tested and see how products compared on quality and cost. I like to take Swanson Vitamin's organic pea protein powder along with its Green Max mixed in. They are inexpensive and don't taste bad or overly sweet like other brands. I use a small, inexpensive, high powered battery powered whisk from Amazon that takes double A batteries to whip it up quickly. Please do a report on Collagen and Protein powders. Some Brands are Bulletproof, Multi-Collagen, Vital Proteins, Great Lakes etc. Thank you. Hi Karla - Thank you for your suggestions, we will keep them in mind. Yes, please check on Vital Proteins Collagen powders. Thanks! I take vital proteins collagen peptide powder. Was going to stop taking it because I did not notice anything. I get lash extensions and my girl has noticed a huge difference in the growth of my lashes I do think the powder is a bit constipating when you first start taking it. Here's a good resource to double check your protein powder. Thank you for clarifying this - I stopped using protein powders b/c they all seem to upset my stomach - I'm using goat milk kefir as a base for my smoothies and its been working great. Thanks for all the great research you guys do! You're welcome Jane, and thank you for your kind words. We are glad to hear you are enjoying ConsumerLab! Stomach upset can be an issue for some people when consuming protein powders and drinks (https://www.consumerlab.com/reviews/Protein_Powders_Shakes_Drinks_Sports/NutritionDrinks/#concerns) so others may appreciate your solution. You can also find information about kefir in the Probiotics Review (https://www.consumerlab.com/reviews/Probiotic-Supplements-and-Kombucha-Drinks/probiotics/#whatitis). Please test protein powders sold by Dr. Joseph Mercola, by Kathy Smith and protein powders under a "Tera's Whey" brand and a brand called "Naked" whey. Thank you. Thanks for all you do, ConsumerLab ! May i request you check out Whole Foods white-label (365 Everyday Value) "Whey Protein Powder" - i typically buy the Vanilla - it's inexpensive, has limited carbs, and contains very few ingredients overall. Thank you for your kind words xkater! We are glad you are enjoying ConsumerLab, and will keep your suggestion in mind for future testing. I liked your last protein powder review. I would like to see more whey/casein blends included in your review. The blends keep me full for hours where as just whey alone only lasts an hour or so with me.If it is just a whey alone product I mix Casein whey product with it. I would like to see reviewed by you are BSN Syntha 6 and Six Star Whey Protein Triple Chocolate. Casein alone varieties are: Six Star Casein Protein and Precision Engineered 100% Micellar Casein. Thank you for all the great work you do. Hi Mike - Thank you for your kind words and your suggestions, we will keep them in mind. Dymatize is my favorite and the make an ISO whey, plus a slow digesting casein. Would love to see them tested. Please include "Hydro-Pro" Advanced Hydrolyzed-Isolate Whey Protein Formula made by EVOchem Nutrition in your test. I use both Youngevity Fitshake, and human Protein 40 and would appreciate testing either/both. Hi John - Thank you for your suggestion; we will keep it in mind. HEMP PROTEIN POWDER BY NUTIVA IS MY CURIOSITY. I USE IT DAILY AND HOPE THAT IT CHECKS ALL BOXES ON SAFETY. I LOVE & TRUST NUTIVA FOR ALL OF MY SUPPLEMENT ITEMS (BAKING PRODUCTS, NUTS SEEDS ETC) AND HOPE THAT THEY ARE AS CLEAN FROM TOXINS AS THEY CLAIM TO BE. Nutivia Organic Hemp Protein Powder is among the products tested in the current review. See the results. Please also test Garden of Life's Raw Organic Protein, Unflavored, Unsweetened powder. 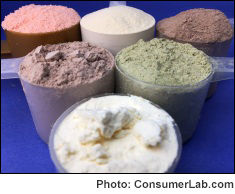 Hello, when you test protein powders can you please test Now protein isolate unflavored and Pro Mix Isolate, as well as a variety of other unflavored isolates. Also, can you review if there is any benefit to grass-fed whey and compare grass fed isolate to concentrate to non-grass fed whey. Also, is there any efficacy to cold-processed isolate or concentrate over other types. Thanks. Thanks for your suggestion. We will soon be publishing a new protein powder/drinks report and these types of products are included. This CL Answer initially posted on 12/4/2018. Last updated 1/2/2019.